At Cox, community service is more than just a corporate commitment — it’s a way of life for our employees and a part of our company culture. Our founder James Cox believed in the value of building and investing in the communities we serve and more than 100 years later, that culture still thrives throughout our organization. We know now, more than ever, there is important work to be done in our communities and we know it cannot be done alone. That’s why Cox is proud to partner with hundreds of nonprofit organizations in addressing the critical needs of our community. Cox's primary focus is on youth, technology and education. Cox supports events, programs and initiatives that further our goal of building strong communities and enriching the lives of those who live there. 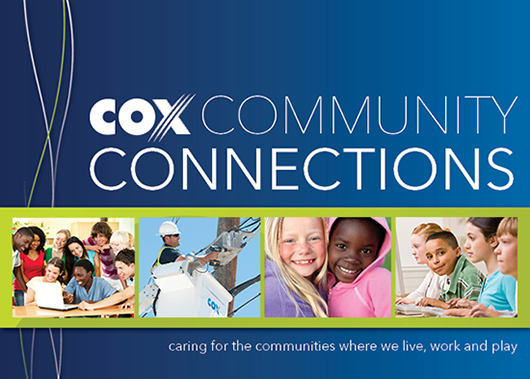 Cox only awards funds to organizations that provide assistance to Cox Communications service areas. Diversity is a core value at Cox and we strongly encourage applications from organizations that meet the needs of our community's unique and diverse population, including minorities, women and the disadvantaged. We also look for opportunities to involve our employees in community projects, combining our financial support with the time and talent of employee volunteers. Please note that funding from Cox Charities requires a separate application. Cox Charities is employee funded and supports local schools and the provision of services provided by non-profit organizations. Funding is granted for programs taking place in the current fiscal year. For more information on funding guidelines, grant deadlines or to submit an application, please visit www.CoxCharitiesCentral.org. Cox Communications conducts a once-a-year sponsorship review process to determine funding for the following calendar year. Applications will be accepted annually July 1 – August 31. Applicants will be notified once a funding decision has been determined. To request sponsorship support, please click here. To request in-kind media (PSAs, production, etc. ), please click here. Please note: The timeframe for accepting 2019 cash sponsorships has officially closed. Applications submitted at this time will be considered for 2020 funding.